In the last post I buried the empire. Now I wish to praise it. Before doing that we need to review some statistics which will give you a sense of the tenuous nature of the Emperor’s position. There were 58 of them from Augustus to the year 363 A.D, when Jovian died and the empire was split into east and west. Of the 58, 30 were murdered by the army, 4 died of the plague, 2 died in battle, 2 committed suicide, 1 was struck by lightning, and 1 drowned. Great men were rare and weaklings ubiquitous. The army lacked real men – leaders made of the same stuff as them -- so weaklings had to pay them to stay alive. But the army was fickle and might give an emperor the sword because it decided it liked someone else better. My use of the term, army, includes the Praetorian Guard who by their position of honor and proximity to the emperor, played a special role in king making. During the time of the Caesars there were occasional periods of calm. 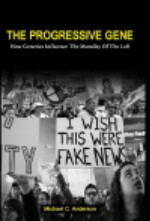 One of these, known as the Golden Age – 98 A.D. to 180 A.D. – is the subject of this article. There are no obvious clues to explain why the empire functioned so well during this period. The four men in charge had very different personalities and they were not equal in ability. Many wars were fought and each man was challenged by instability, yet the empire ran smoothly. Maybe it was luck. Let’s look at each of these four men in detail so we can understand the threads that drove the empire during this time. 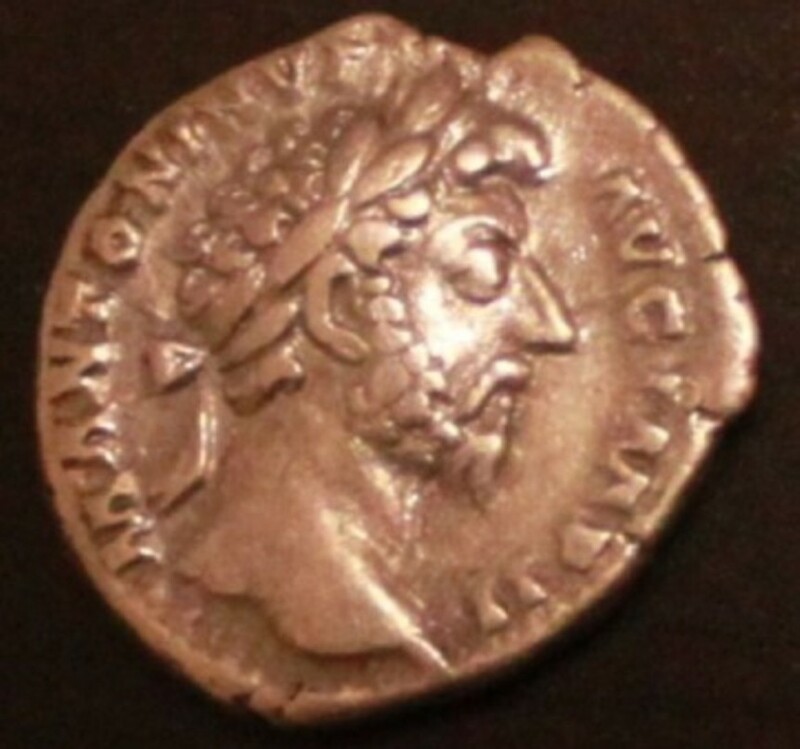 For each I have included an image of their silver denarius from my collection. The coins lend a physical reality to the story of the man. Trajan. 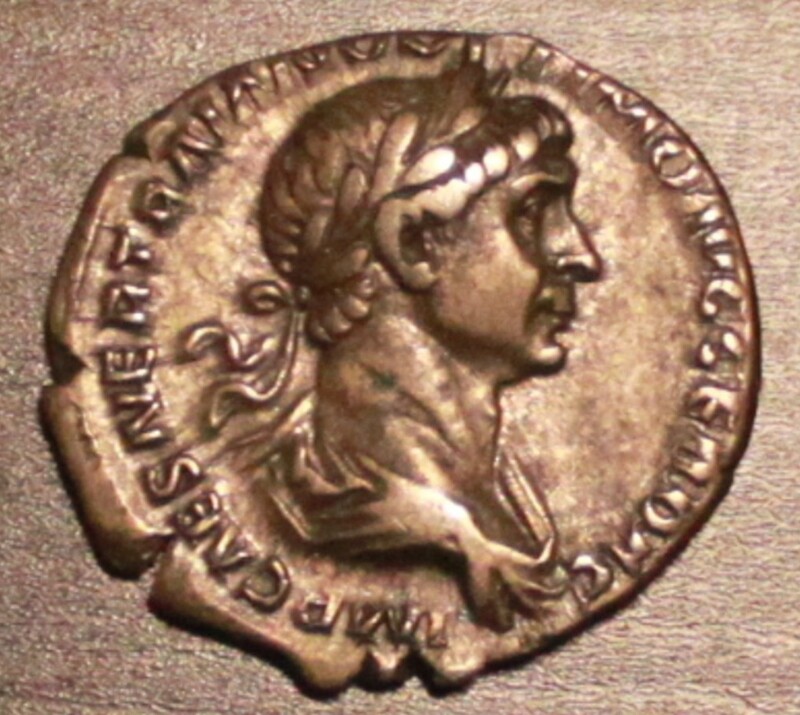 The inscription on his coin is IMP CAES NER TRIANO OPTIMO AUG GER DAC which means Imperator (emperor) Caesar Nerva (son of) Trajan Best Augustus Germanicus Dacicus. 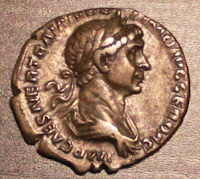 The coin was struck 114 A.D.
Trajan reigned from 98-117. Loved by all feared by none, save the enemy. Trajan was considered by many as the greatest Roman emperor after Augustus. A saying went “may you be as lucky as Augustus and as great as Trajan”. The son of the commander of the tenth legion who became consul in 70 A.D, Trajan was the first Roman emperor not born in Italy (Seville). He was commander of the seventh legion in Spain and found favor with Commodus before the latter’s assassination. Later made governor of upper Germany in 96 A.D. and adopted by emperor Nerva, Trajan was a born warrior who loved the fight. He suppressed Dacia (modern Romania) in the period 101-106 and the Parthians (Iran) during the years 114-117 before a stroke killed him at Cilia (Southeastern Turkey). Trajan’s legacy is the great column that sits near the Roman Forum, a one hundred foot chronicle of his conquests. His ashes were buried there after his death. Hadrian. The inscription on his coin is HADRIANUS AUG COS III PP which means Hadrian Augustus Consul Three times Father of his Country (Pater Patriae) The coin was struck between 134-138 A.D.
Hadrian reigned from 117-138. More a thinker than a fighter. Like Marcus Aurelius in many ways. Son of a cousin of Trajan, taken in as Trajan’s ward to learn discipline, Hadrian later commanded the fifth legion on the Danube. When Nerva died Hadrian was the first to give Trajan the news by outrunning others carrying the message. His succession to emperor was obscure. Trajan never said publicly that he intended Hadrian as his successor and when he died, the message naming Hadrian was signed by the empress who claimed Trajan was too ill to write. She was known to favor Hadrian over other candidates. The new Caesar’s reign began badly when he had four ex-consuls killed for plotting his overthrow. The Roman people never forgave him for this offence. Still, he was a more than capable ruler, adopting a foreign policy to abandon the territories taken by Trajan and bring the borders of the empire back to its natural limits at the Rhine, Danube, and Euphrates – a very practical decision. Hadrian traveled extensively (more than half his reign), visiting the provinces, fortifying the borders (e.g. Hadrian’s Wall), and spending time with the army. He loved the Greeks and traveled to Athens twice. While there he sponsored construction projects like others across the empire. At the end of his life when faced with the succession issue he adopted Lucius Ceionius Commodus, but Lucius died of tuberculosis a year later. Now Hadrian executed a twin adoption. 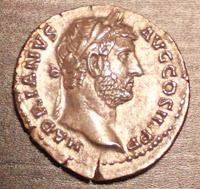 As Caesar he named Titus Aurelius Fulvus Boionius Arrius Antonius who would become Antonius Pius. He also required Antonius to adopt two young men to become his successors: Lucius Ceionius Commodus, son of the emperor designate who had died and Marcus Annius Verus grandson of a close friend of Hadrian. Hadrian was very ill at the end of his life and had to be prevented from committing suicide on several occasions. 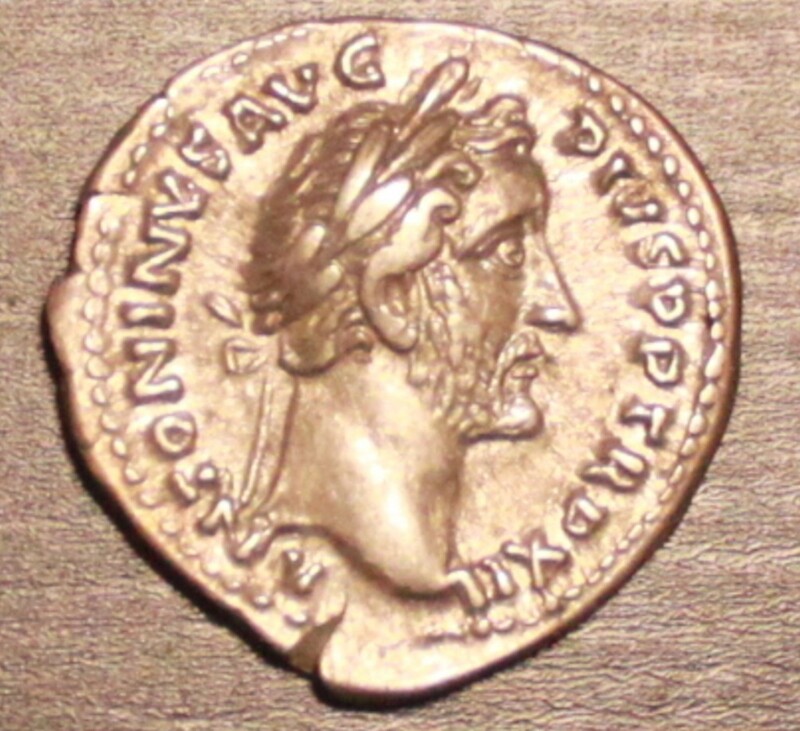 He finally succumbed on July 10th, 138 A.D.
Antonius Pius. The inscription on his coin is ANTONIUS AUG PIUS PP TR P XII which means Antonius Augustus Pius Pater Patriae Tribunicia Potentate twelve times. 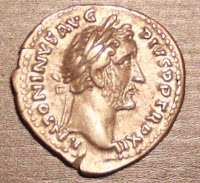 The coin was struck 149 A.D. indicating the twelfth year of his reign. Marcus Aurelius. 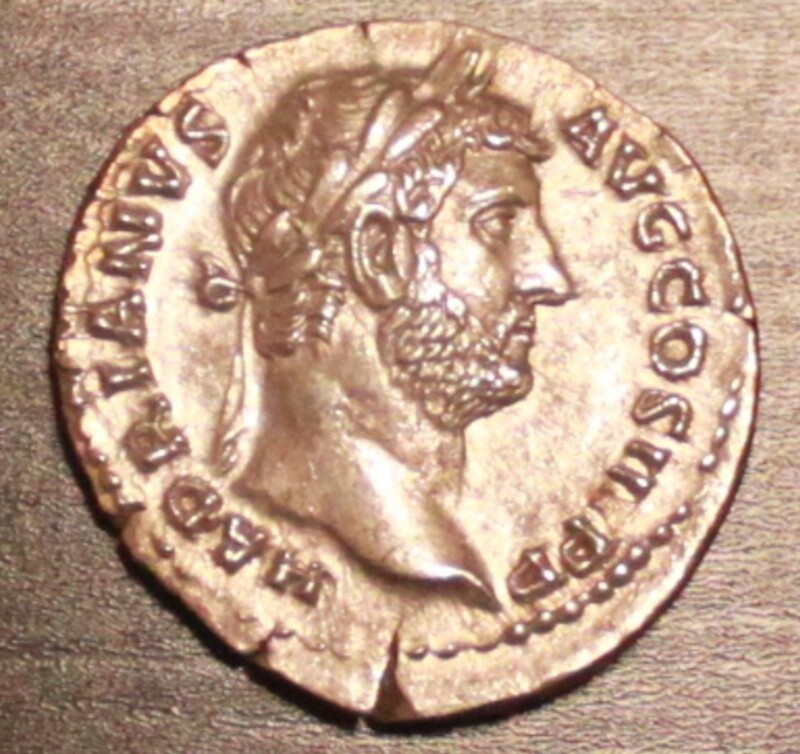 The inscription on is coin is M ANTONIUS AUG IMP II which means Marcus Antonius Augustus Imperator II. 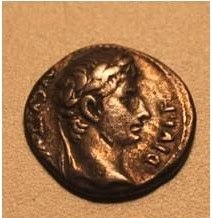 The coin was struck 162 A.D. When Marcus Aurelius became Caesar in 161 A.D. he named his brother Lucius Verus as an equal and designated him as co-Caesar and Augustus. As peaceful as the reign of Antonius Pius was, we find the opposite in the reign of Marcus, as if the gods were blocking him from pursuing his life’s calling as a peacemaker. Immediately there were attacks in the east and the north followed by invasions and plague. Verus, showing himself a worthy partner, fought the Parthians from 162-166 A.D. but then his troops brought the plague home with them. The emperors went north to fight the Germans in 168 but Verus died of a stroke in 169. Marcus fought the Germans from 170-175, returned to Rome for three years, and then attacked the Germans again starting in 178 A.D. He died there in 180 A.D.
What of these four men -- the men that reigned in the golden age of the empire? A warrior, a man comfortable with battle, a peaceful man, and a philosopher forced to be a warrior. They represent all that can be good in men along with the faults all men possess. Rome could have used more like them. Surely what the four have in common is that they at least tried to rule well, and not purely for their own advantage. What made it a 'golden age' was simply to have four such men in succession. Mike you say maby it was luck,I say maby conditions were made right for the spread of Christianity by the fledgeling church and the preaching of the good news believe in the Lord Jesus Christ and you will have eternal life John 1 : 12. Spartacus and the Slave Revolt of 73-71 B.C.